What the heck are Fidh Lan Sticks? Well, basically it is a method of doing readings that uses 4 small sticks. Why do we get SO excited about these silly sticks? Well, lots of reasons. They are VISUAL, they are interesting to look at. Very vew people have ever seen them, so unlike Tarot and Palmistry where people may decide to argue with you about meanings, with Fidh Lan YOU are the expert right away! Each stick has a single spot on one side, and the opposite side has two spots. When the sticks are laid down one above the other, they can form 1 of 16 patterns. Each pattern is a simple pictograph that represents something. From this, the reading grows. Some of the things that make Fidh Lan SO awesome is that it is small, light weight, visible, easy to learn, easy to understand, few of your clients will have seen or heard of it before so there are no pre-conceived ideas or fears as with Palms or Tarot. On the DVD rom portion of the DVD, we decided to include a PITCH BOOK which you may print up and sell and use for Back Of Room Sales! This is an awesome money making bonus for those who do psychic house parties, and the sticks are unusual enough that many will want to learn more about them. Tarot cards are harder to learn, and some people can be downright scared of them- not good for all clients. Palm reading is more complex, and can be tricky for the first time reader, and in some situations might be too intimate. Fidh Lan, a simplified form of Geomancy, is easy to learn, looks like nothing they have seen before and by its nature looks kind of magical and different. The sticks can also be "themed" to fit a variety of different kinds of events. They can become Wizard sticks, Witch Lots, Fairy Twigs and many other things. The basic method can be adapted to reading shells, coins, dirt- or even done with a pad and paper. We cover ways to do a simple quickie reading, answer a question, and more in depth methods of reading that use various colors and levels to add complexity to the reading. We teach a basic one figure reading, as well as more complex readings using Tarot-type "spreads." Volume two offers sample readings, many suggestions on the business side of things and ways to make MONEY doing readings, psychic house parties and more! 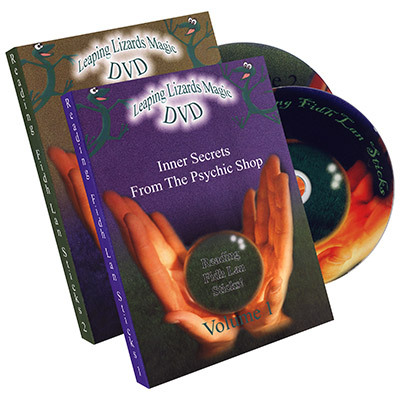 The two DVD set follows a similar format to the DVD sets we have recently released on Palm Reading and Tarot. The sticks are something you can easily create on your own, but owners of the DVD will also receive special discounts should they prefer to purchase a set through the support page. Simple, easy, eye catching and direct!